Not only is this one delicious smoothie, it’s creamy and has a nice mouth feel. Definitely a keeper that I’ll be making again. This is the kind of smoothie I like to make for dessert or as a treat, a nutritious and healthy treat that is. Good natural source of protein. A 6-ounce serving contains 15 to 20 grams. Greek yogurt is rich in beneficial bacteria or probiotics. These friendly flora are essential to proper digestion, assimilation of nutrients, and immune system functioning. Good source of calcium that’s more easily absorbed due to the beneficial bacteria or live cultures. Greek yogurt has 40% less sugar and 38% less sodium than most traditional yogurt. For more information on Greek yogurt, I suggest you head on over to Greek Yogurt Paradise. 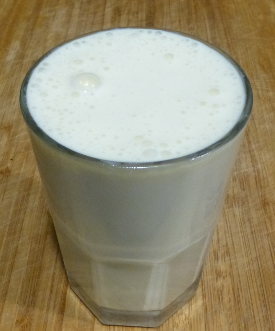 If you want to check out the original recipe I was inspired by: Greek Yogurt Pina Colada Smoothie. I made this smoothie without a sweetener. The pineapple provided plenty of sweetness for my taste. Enjoy! I’d love to know if you try this pina colada smoothie and how you liked it. Please leave a comment below. Happy Blending! Hey Ryan, cool that my recipe inspired you and thanks for mentioning my blog in your post. I’m glad to have discovered your website, so many tasty things on here! You’re very welcome! I’m glad to have discovered your wonderful website and information on Greek yogurt. Hi,this pins colada smoothie recipe looks really good and I am going to make it in my magic bullet blender asap.I was wondering if this smoothie can be put into Popsicle molds to make Popsicles?can most of your smoothies from your website be put into Popsicle molds or cups? Great idea, Kim! Yes, this, and all of my recipes can be made into Popsicles. Hi,I would like to try this pina colada smoothie and to make it in my magic bullet blender,but it is high in sugar but good in healthy fats.I was wondering if I were to put 1/2 a cup of pine apple chunks in this smoothie that the sugar would go down in this smoothie.can I use light coconut milk in this smoothie along with the almond milk? I will put the other ingredients along with the milk and coconut shreds in my blender when I decide to make this smoothie which will be sometime this month or in September.I will let you know how much I like and enjoy drinking this smoothie after I make it in my blender,and I will share it with my mom. Yes, using 1/2 cup of pineapple will reduce the sugar by almost half. Light coconut milk is a good option. I hope you and your mom enjoy!